First then, it is a singular remedy against all melancholick diseases, Tremor cordis, and Maladies of the spleene. It is purgative and of great operation against all gripings of the small guts. It cures the stone in the Bladder, or Kidneyes, and provokes Urine wonderfully. It mollifies Tumors and swellings in the body, and is very predominant in opening the obstructions of the Liver. It is most effectuall for clearing of the sight, being applied outwardly. It asswageth the unsufferable paine of the Gowt. 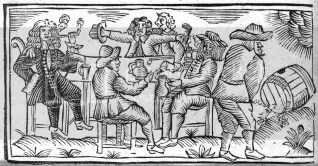 Ale was famous amongst the Trojans, Brittaines, Romans, Saxons, Danes, Normans, English men, Welsh, besides in Scotland, from the highest and Noblest Palace to the poorest or meanest Cottage. Ale is universall, and for Vertue it stands allowable with the best receipts of the most Antientest Physitians. Ale is rightly called Nappy, for it will set a nap upon a mans thred bare eyes when he is sleepy. It is called Merry-goe-downe, for it slides downe merrily. It is such a nourisher of Mankinde, that if my mouth were as bigge as Bishopsgate, my Pen as long as a Maypole, and my Inke a flowing spring, or a standing fishpond, yet I could not with Mouth, Pen, or Inke, speake or write the true worth and worthinesse of Ale. This is another of the brews we’ve made, taken from Digby. This small ale recipe gives a low-alcohol sparkling drink with the flavour of the hops rather than barley. Unusually, this recipe calls for the first run through the mash, rather than the second or third. If you want to use a dried malt, work out the amount for about 1% alcohol, I’ll post instructions for that process soon. The Ale, that I used to drink constantly of, was made in these proportions. Take fourteen Gallons of Water, and half an Ounce of Hops; boil them near an hour together. Then pour it upon a peck of Malt. Have a care the Malt be not too small ground; for then it will never make clear Ale. Let it soak so near two hours. Then let it run from the Malt, and boil it only one walm or two. Let it stand cooling till it be cool enough to work with barm, which let be of Beer rather than Ale, about half a pint. After it hath wrought some hours, when you see it come to it’s height, and is near beginning to fall in working, Tun it into a barrel of eight Gallons; and in four or five days it will be fit to broach to drink. Since I have caused the wort to be boiled a good half hour; since again I boil it a good hour, and it is much the better; because the former Ale tasted a little Raw. Now because it consumes in boiling, and would be too strong, if this Malt made a less proportion of Ale; I have added a Gallon of water at the first, taking fifteen Gallons instead of fourteen. Since I have added half a peck of Malt to the former proportions, to make it a little stronger in Winter. The Small ale receipt makes 36l of small beer from 63l of water, 9l of malt, 14.2g of hops and 300ml of liquid beer yeast. This recipe is a recalculation from the original quantities, at 62.5% to make 23L of wort to fit our fermenter. Put the grain in the mash tub. Add 4-8 g CaCO3 to 20L of water and boil. Pour the boiling water into the mash tub over the back of a wooden spoon or through a sieve without disturbing the grain and allow to rest at 66-70 degrees for 60-90 minutes. Add some extra boiling water if necessary to hold the temperature in this range. Slowly draw the wort off into the boiling pot without disturbing the grain bed and begin heating when there are two or three litres in the bottom of the pot. Once the wort has been boiling for at least 30 minutes and there are signs of hot break, add the hops and boil for a further 60-90 minutes. While the wort is in the last 30 minutes of the boil, activate the yeast. Use about 10 to 15 ml of tepid water per gram of dried yeast in a suitable sanitised vessel. After about five or so minutes swirl the cup to make sure any yeast still floating is thoroughly soaked. 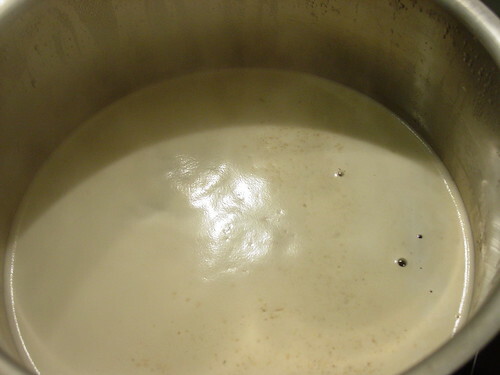 Generally, the yeast should take 20 to 30 minutes to re-hydrate and be ready for pitching. At the end of the boil place the pot in a water bath in the sink, change the water is once. This gets the temperature down to about 35 degrees. The wort is stirred a couple of times to help cooling, add oxygen for the yeast and to get everything to clump together. Tip into a sterilised fermenter, add chilled water to 23L, pitch the yeast and cover. Ferment as usual and bottle with 6 small split raisins. This should be drinkable in a week.